Advanced Encryption Standard implemented in Cocoa. Is there a better alternative to Xaes? Is Xaes really the best app in Security category? Will Xaes work good on macOS 10.13.4? Xaes is a GNU GPL project of Advanced Encryption Standard. Dr. Gladman C API used. 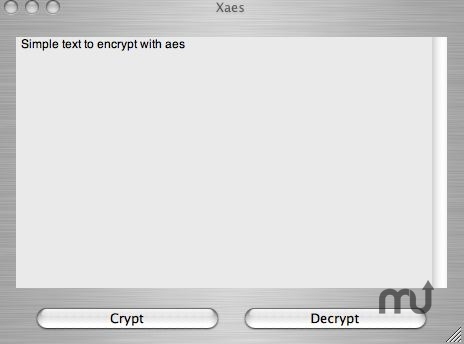 You can Encrypt/Decrypt a text, a file from Xaes application or Services menu. Key is stored in keychain in System Preferences. Service no more use pasteboard, replace selected text directly. A version for Mac OS X 10.3 available here. A version for Mac OS X 10.2 available here. Xaes needs a rating. Be the first to rate this app and get the discussion started!